After dismal sales of the Nintendo 3DS (and declining sales of the Wii and Nintendo DS), Nintendo issued a massive, uncharacterisitc price cut for its newest handheld. It plans on compensating early adopters, but what of the 3DS owner personally wounded by Nintendo's cutting? Nintendo president Satoru Iwata colored the announcement of the 3DS price drop with a letter to Japanese consumers that was half explanation, half apology. Giant Bomb translated the letter to customers, specifically Iwata's humble statements, giving us a look at the frank language that Nintendo is using to explain the need to cut deep and fast. "We are all too keenly aware that those of you who supported us by purchasing the 3DS in the beginning may feel betrayed and criticize this decision," Iwata says in the translated letter. "This unprecedented timing for a price cut is because the situation has changed greatly since we originally launched the 3DS. We decided it was necessary to take this drastic step in order to ensure that large numbers of users will continue to enjoy the 3DS in the future." Iwata says to customers who may feel "punished" by jumping into Nintendo 3DS ownership early that the price drop is ultimately good for them too. 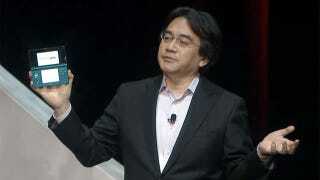 "If the software creators and those on the retail side are not confident that the Nintendo 3DS is a worthy successor to the DS and will achieve a similarly broad (user) base," Iwata writes, "it will be impossible for the 3DS to gain popularity, acquire a wide range of software, and eventually create the product cycle necessary for everyone to be satisfied with the system." Not particularly revelatory, but also not your typical price drop PR speak. Read more at Giant Bomb.